One question that gets asked a lot is "How do I add in my own logo to ProForm courses?". Although it may seem tricky at first, it is actually easy to do once you know how. In this blog post I will teach you the steps to apply your own logo to any ProForm course. The first step would be to make sure you start a new course or go into one you have already started. Once you have your project started you need to navigate to your project folder. Your project folder is the location on your desktop where you saved your project. Each course has its own folder. If you cannot remember where you saved your project folder you can always check by clicking on your project settings and looking at the project folder path as shown in this screen shot. In my case I have saved my project folder on my desktop. So I need to navigate to that folder on my desktop. 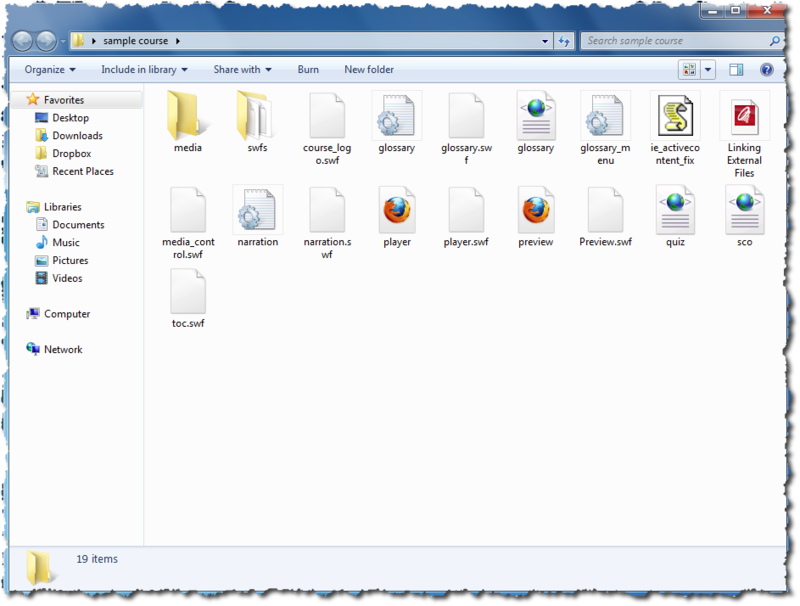 Once you have located the appropriate folder, open up that folder with your windows finder as seen here. Here is where you will find all of your project files. That file gets placed into your course style. You have two options. You can either just delete that file and have no course logo or you can create your own course logo in two different ways. The next step will be split into A and B options to show you the two different ways you can get a course logo ready to be used in your courses. The first option would be to use your own jpg image. You need to first of all delete the current course_logo.swf file. Once you have done that you can now get your own jpeg ready to be used as the course logo. The size of the course logo depends on the course style that you may be using. The best way that I have found to get the size is to measure the old course logo that was in there before you delete it. There are many different measuring tools out there like Snag It or other tools that will do this for you. Once you have determined the size of the old logo you can use that as a target for your logo size. Most logos are around the 164x63 pixels size. You may need to tweak here and there. ProForm courses look for either a file called "course_logo.swf" (which is the file we already deleted) or if it cannot find that it will look for a .jpg image called "course_logo.jpg". Once it finds that image it will then use that as the course logo. Now that you've saved your image under the proper name, simply take your image and drag and drop it into your project folder. After you have moved it over to the project folder, go ahead and preview your course and you should see the logo appear in your course. If you are still seeing the old logo make sure you have deleted the course_logo.swf file. So the question is, if the above method works just fine why would I even need to read this step? Truth is you don't need to read this step if you are happy with the way your .jpg logo looks in your course. However, some of you may notice that when using a .jpg that your logo can only be on a white background, which may be problematic if your logo normally has a transparent background. .jpg files cannot support transparency so you are sometimes stuck with that white background, which in some cases may look just fine but not always. Personally, it drives me nuts to see the white background when the rest of the style may be a color like black or blue. That is why I like this other option. This option is to create a SWF file. 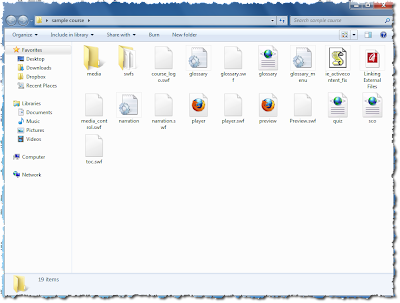 A SWF file is a Flash animation file. However, many programs can save images into SWF files without even using Flash or even having Flash. One of those tools is our very own called SWiSH. SWiSH is a great, inexpensive tool that will not only help you animate but in this case help you create a transparent logo. You can just bring in your PNG file into SWiSH and save it as an SWF file. Name it "course_logo.swf" when you save it and drag and drop it into the same location as your project and it will show up in your course as a transparent .swf file. Again, you could also just use something else like Flash or Illustrator to save your image as a SWF if you are familiar with those programs. Hopefully the above tips have enabled you to upload your own logo into ProForm. If you need any other help, please comment below or email our support at support@rapidintake.com.